Ancient Gold Necklace–Oldest Ever Found! Although this story was widely reported worldwide in late March, I thought the necklace so beautiful and the story so amazing that I just had to include it as well. This gold necklace was found near Lake Titicaca in Peru and dates back more than 4,000 years (around 2100 BC) , making it the oldest artifact found in the Americas. The necklace was found in a burial pit and was all the more surprising because it was found among a society that was in the beginning stages of agriculture, meaning that they were just starting to settle in one place, rather than roam in search of the next meal. So, to find the time and means to make such a necklace meant that they had more time on their hands than just to hunt and gather for food and general survival. 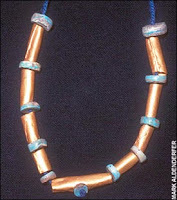 The nine gold tube beads were made from local gold that was hammered flat and then rolled, perhaps around a twig, and strung, alternating with round stones identified as either greenstone or turquoise, on wool string. The result is a certain amazing sophisticated beauty! From the earliest civilizations, it seems that people have yearned for adornment. So I guess it shouldn’t be surprising in the least, that we all still love shiny, pretty jewelry!